and inventory software for wineries. How can we help your winery? Generic products available for inventory control or relationship enhancement seem to offer an easy solution to the distribution dilemmas faced by wineries. But even the slickest package is useless if it too complex or simplistic to meet the challenges of the wine industry, and the specific challenges of your winery. An unused or underused package can be worse than no package at all. One size does NOT fit all. Consolidation of distribution has meant that small wineries have a difficult time commanding the attention of a distributor's sales staff, and to find distribution in a given market. Most wholesalers also sell spirits and beer - which means even less attention paid to wine brands. Differentiating a brand from its competition becomes a key factor in your market positioning. 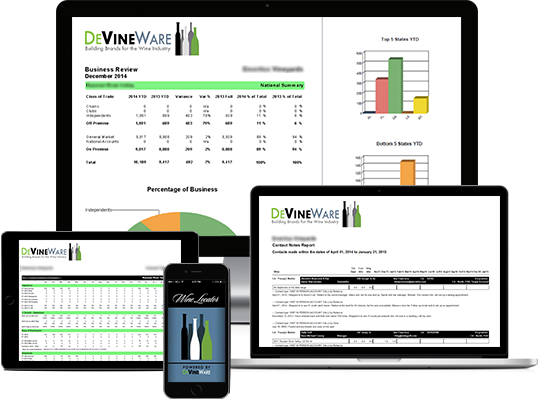 With over sixty years of combined wine industry expertise, DeVineWare's wine industry experts develop customized databases designed to enhance the specific needs and brand management of an individual winery—not a brewery, distillery, or factory. Access all your DeVineWare data, run reports, enter contacts and notes on your smart phone, tablet and browser. Integrate, facilitate, and support communication between distributors and restaurants by the winery, differentiating your winery from the competition. Help consumers find your wine with just a click...or a tap. 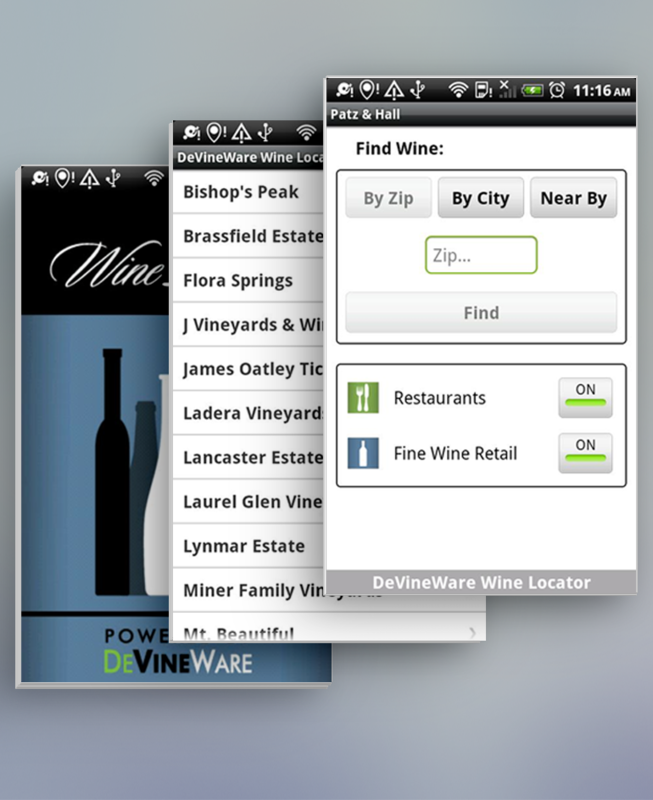 Using the data collected by DeVineWare, DeVineWare's Wine Locator App, available for iPhone, Android or as a customized add-in to your website, lets consumers easily locate your wines at home or on-the-go at retailers and restaurants nationwide. Information is updated on a monthly basis, to keep your placement information current. Since DeVineWare's inception in 2000, we have developed a client list that we are very proud of and are happy to serve. Many of our clients came to us through referrals and word-of-mouth. We are honored that they have provided us with their endorsements. "We have tried other software, but DeVineWare has given us the ability to view and manage our business in a dynamic manner. The software has supported our efforts in evaluating our business from the distributor level and account level, allowing us to drill down to great detail or view in a larger perspective. DeVineWare allows us to be effective in our efforts in the field in identifying salesperson performance or in a review meeting identifying opportunities to grow our business. Service and support is also top notch." "DeVineWare is an incredible service for my business. It allows me to know the who, what, where and when. Ignorance is not bliss; in order to talk intelligently to your distributor you need this tool." "Mostly I view my business from 30,000 feet. DeVineWare has supported my vision to strategically build my business by driving distribution to build sustainable brand growth. Not that I micromanage at all, but when I look at trends and specific customers that build our business, then DeVineWare is the tool that is my guide." "At Hanzell Vineyards we carefully manage each and every detail of our grape growing, our winemaking, and caring for our bottled wine. With our commitment to quality it is only logical that we follow our wine directly to our customer and consumer. We, of course, use the best tool possible for this information and customer service, DeVineWare." "DeVineWare has given our winery amazing insight about our customers. I'm much more effective when I visit the market or talk with my brand manager because I know who my customers are and what they've been buying. Best of all, I keep all of this information on my smartphone so it's easily accessible right when I need it. I can't imagine operating our business without DeVineWare." "DeVineWare has been invaluable in helping us manage our business at Kistler. We analyze our business at an account specific level and are very focused on restaurant placements. I am able to use reports to target accounts, forecast sales and set distributor goals. We used to process data internally using Microsoft Access. Subscribing to DeVineWare has saved us 7-10 days per month of administrative work. That savings itself has virtually paid for our subscription." We have allied or partnered with several widely-used wine industry software and service solutions. It is our belief that with all the solutions for information and services available in the wine industry, there is still no one solution that takes care of 100% of the needs of a small to medium size winery. By integrating and providing feeds to other third party vendors databases, we have achieved a seamless link between our information warehouses. This means more efficient and effective information sharing and less redundant systems and data entry. By leveraging other solutions core competencies, you can use the software and services that you like - and you don't have to reinvest your time and resources on learning new software. We have developed an interface that reads sales orders from Nexternal e-commerce site directly into our DeVineWare Distributor, Account, and Direct Channel Database with automatic reduction of inventories. The DeVineWare / VinNOW integration allows wineries to seamlessly integrate VinNOWs orders, inventory and Custom Integration Options Available Accounts Receivable information, with DeVineWare's core competencies of 3-Tier Sales Orders and inventory management with a full complement of Account and Distributor sales depletions and management reporting tools. Click on any department to send us an email.